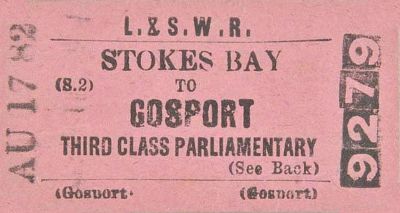 In 1846 an unsuccessful proposal was made to open a branch line off the main Fareham to Gosport line (opened 1841) from near Gosport Terminus to Stokes Bay pier in order to take passengers onward to the Isle of Wight. There was one station on the route - Gosport Road. 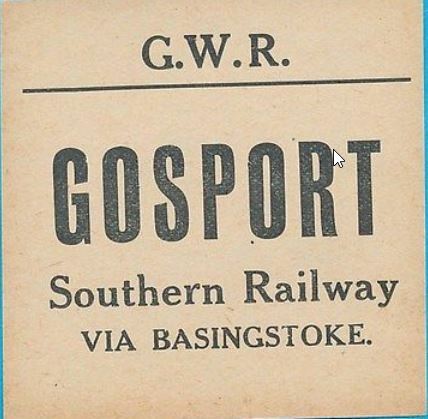 This line was advertised as the Gosport Pier and Branch Railway. It was promoted again in 1854 as the Stokes Bay and Isle of Wight Railway and Pier Company, but the London and South Western Railway (LSWR 1898-1923) would not support the scheme. The Stokes Bay and Railway Pier act was passed by Parliament in 1855 after the Company agreed to let other ferry operators use the pier. 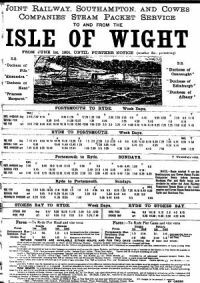 In February 1856, the Stokes Bay and Isle of Wight Ferry Company was formed, and in November 1857 royal assent was given to an act of parliament authorising the purchase of the Stokes Bay Railway and Pier. 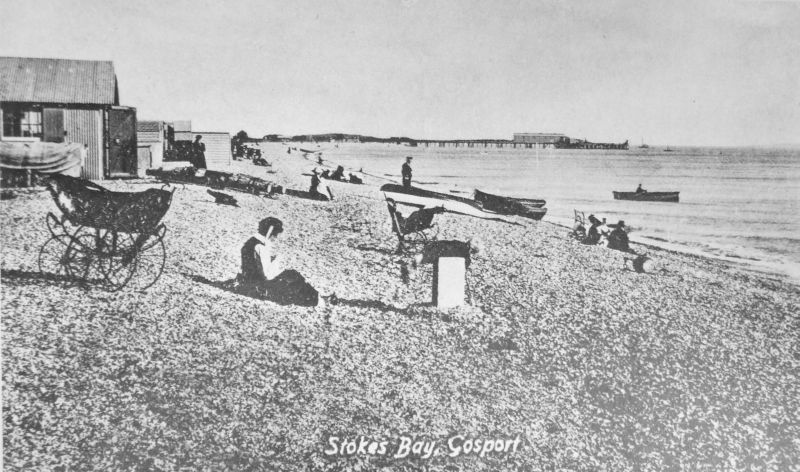 Stokes Bay Pier in 1873. The pier was constructed 1862-63 and passed an inspection by the Government Inspector. The line eventually opened on 6 April 1863, under the Stokes Bay Railway and Pier Company, to transport passengers to the ferry terminal on the pier, from where they could journey on, by steamer, to the Isle of Wight, with an advertised crossing time of 12 minutes. 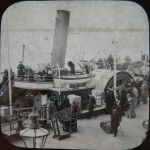 The 45 ton iron steamer Gareloch ‘….a long narrow boat’, began making five passages each day, averaging about 15 minutes per trip and a capacity for 300 passengers. Briefly from from 4 May to 3 June 1863 Southampton steamers also maintained a service from Stokes Bay to the Isle of Wight but made the passage to Cowes direct. 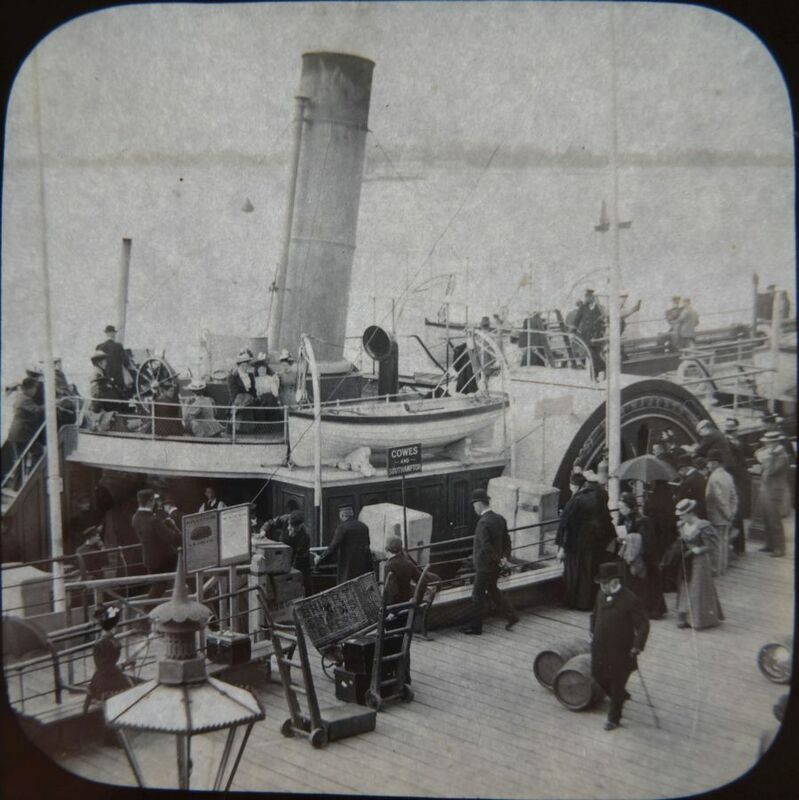 In February 1863 it was announced that the Ryde Ferry Company intended to put on "three Clyde steamers of the most improved build to run the passage from Stokes Bay Railway and Pier and Ryde Pier in ten minutes". At the beginning of May 1863 the iron hulled Chancellor, a large two funnelled steamer (stated in the press as being of 160.71 gross tons) arrived from Clyde to maintain the Stokes Bay to Ryde service. She was also to undertake round the island cruises to Guernsey, Jersey, Poole and Le Havre. The Chancellor made her first excursion on 29 June 1863, taking holidaymakers from Stokes Bay to Ventnor. The trip across The Solent took 11 minutes. Her second and last trip to Ventnor was made on 1 July 1863 after which it was found "….although being painted up very showily, she was quite rotten.."
Stokes Bay Pier : 1890. In 1868 the band of the Royal Marines performed concerts on the Stokes Bay pier on Saturday afternoons in the Summer months. 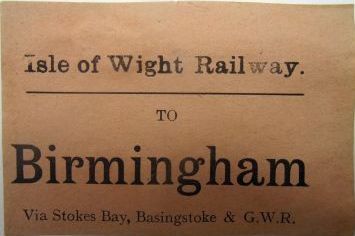 The South Western Railway Company laid on special trains from Fareham and Brockhurst. In February 1870 the press reported that it was intended to enlarge the pier to accommodate large steamers sailing to America. The company sold the branch to the LSWR in 1875. 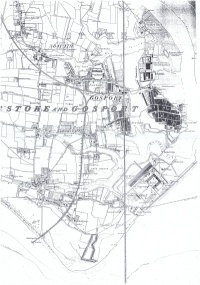 The double track route ran from Gosport Junction, through Stokes Bay Junction, to Stokes Bay Pier. 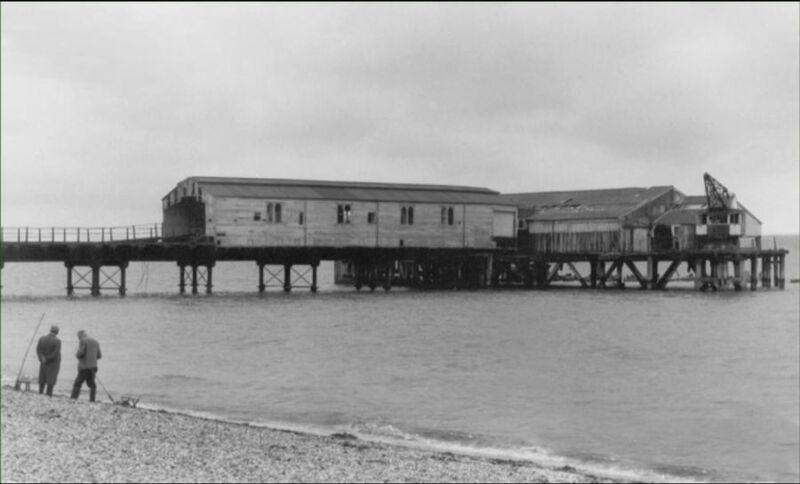 The terminus was constructed entirely on the pier, which had two wooden platforms, a waiting room and offices. The pier itself had berths for four steamers. In 1895 an inspection of the pier led to its closure for a while and a temporary platform was added to the north of the pier. In 1896 it was partially rebuilt at a cost of £6,000. 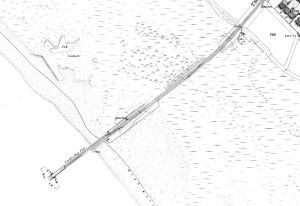 The line occasionally handled goods (there was some gravel traffic from a siding at Clayhall Road) and Mr. Leather (who built Fort Gilkicker and the Spithead Forts) ran his own branch line from the terminus to his construction yard nearby, which also had its own pier. 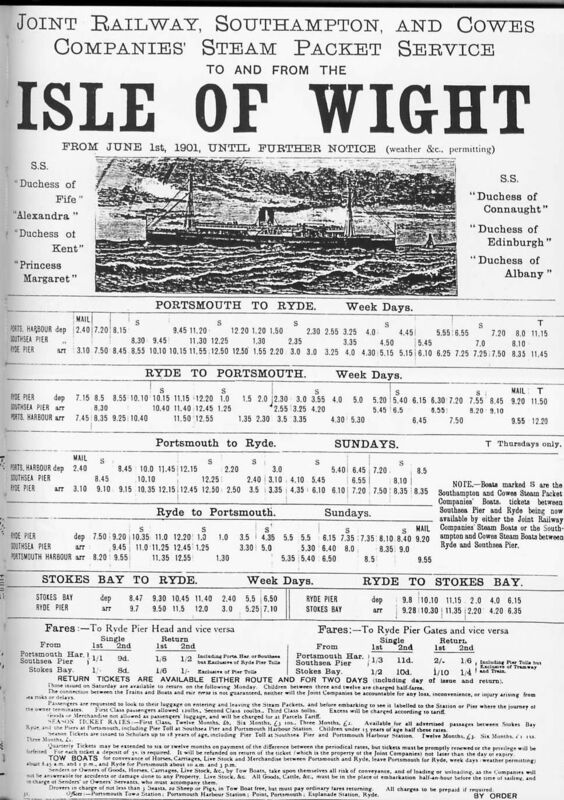 From June 1901 services to the Isle of Wight from Stokes Bay were provided by the Southampton and Cowes Steam Packet Company and the the Joint Railway Company boats. From 1902 the steamers ran to the island during May to September and service was suspended from 1st October. The steamer service ended in 1913. 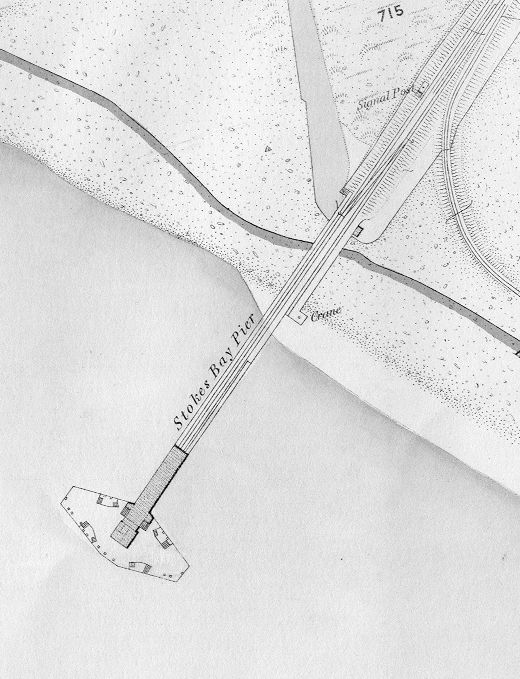 Stokes Bay Pier on a plan of 1898. The last passenger train ran on the 30 October 1915 and the line closed to passengers on 1 November 1915. 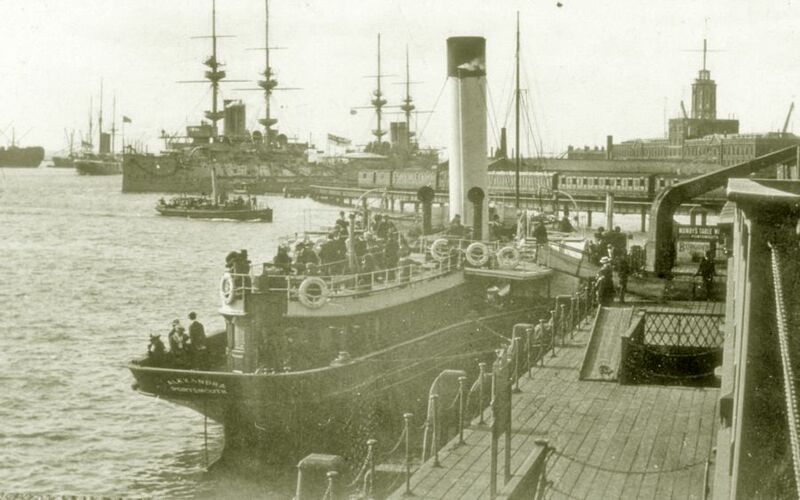 The Admiralty rented the pier during WWI and contunued to run good trains with munition etc. possible until 1918. 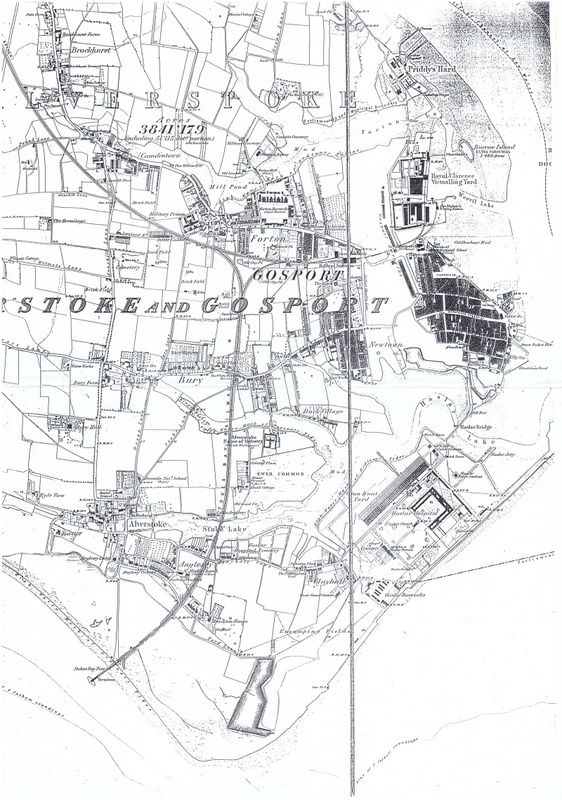 They bought the line as far as Gosport Road Station in 1922. 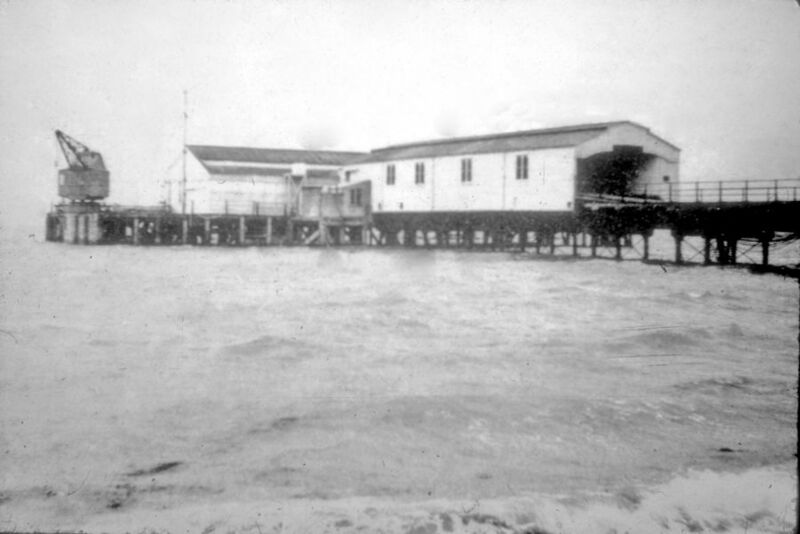 The pier was rebuilt with a complex of buildings to form the Torpedo Experimental Station part of H.M.S. Vernon. Here the pier and its cranes were used for the preparation of torpedoes for test runs. 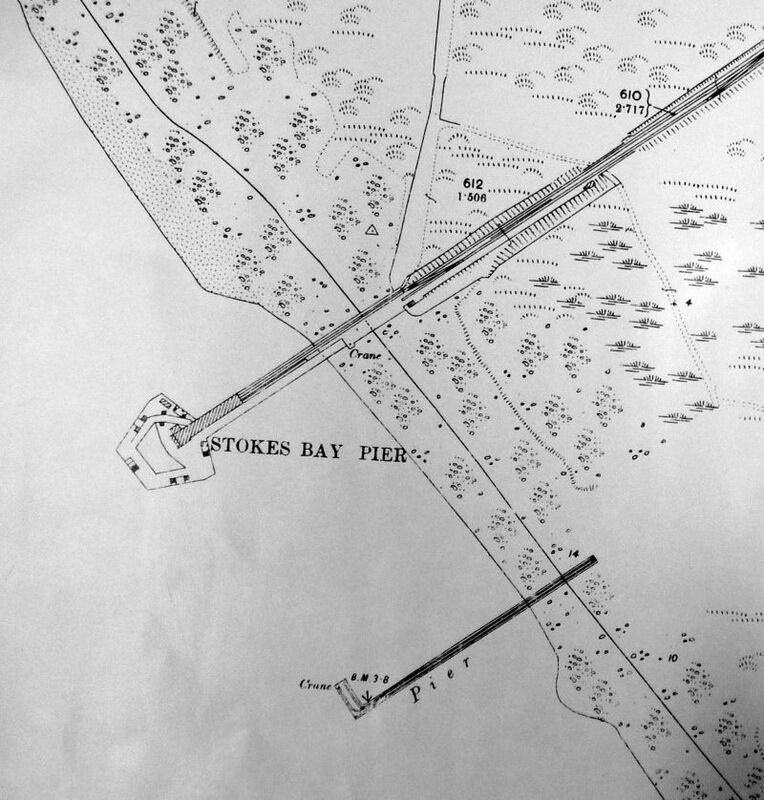 By the early 1930s Stokes Bay was used for air dropped torpedo tests and the pier was used for recovering torpedoes. According to the minutes of Gosport Council the track from the pier to The Cresent was lifted in 1933. 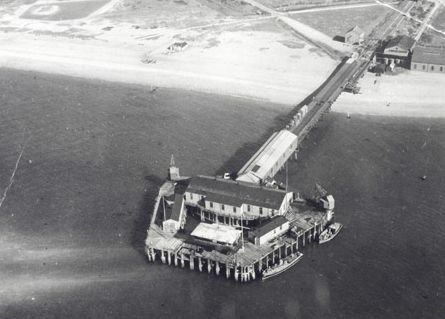 During World War Two the pier sustained some damage from an air attack. During the D Day landings, June 1944 the pier was the mooring point for large L.C.H. (Landing Craft Heavy) and Motor Launches. 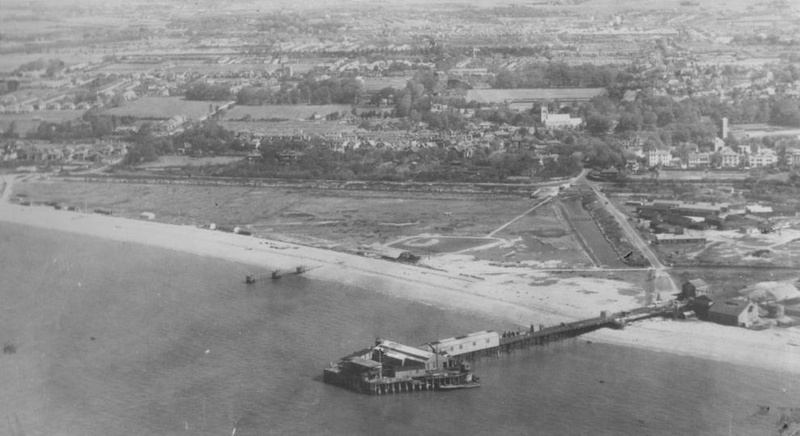 In 1946 the pier was part of the A.T.D.U. (Aircraft Torpedo Development Unit) with combined R.A.F and R.N. 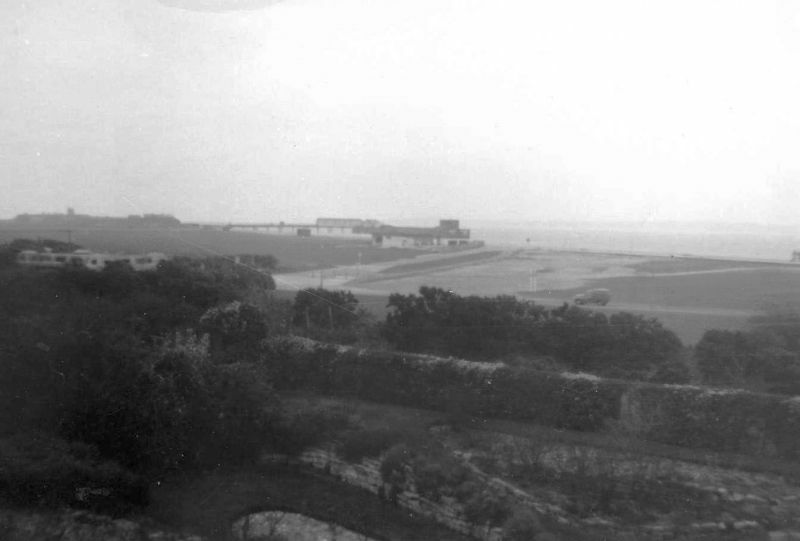 staff quartered in Fort Grange, part of the Royal Naval Air Station HMS Siskin. In 1953 the Admiralty fenced in the pier. The last use of the pier was by the Royal Naval degaussing service (A.D.G.E.) until it moved to Fort Rowner. 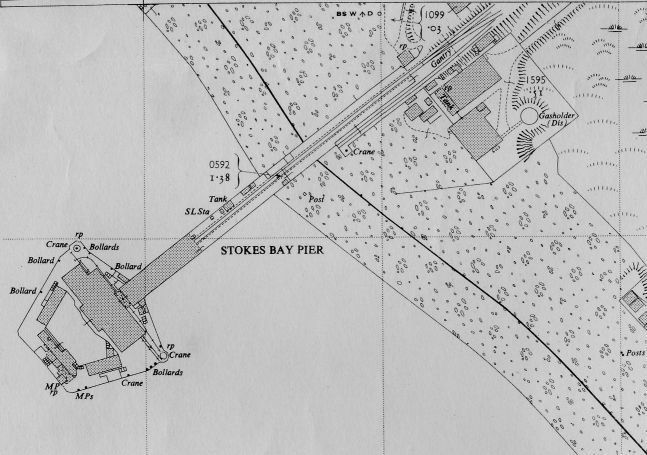 Stokes Bay Pier (plan surveyed in 1949). The buildings on the pier were removed in the 1960s and the pier was demolished in stages between 1972 and 1976, but leaving the piles and putting up warning notices. The council minutes for September 1974 note that the demolition of Stokes Bay Pier should have been completed by December 1972 but it is still not finished! Again the minutes for April 1975 note that the there was a contract to clear the pier and remaining military buildings at landward ends so that a carpark could be built. It was not until 1985 that the supports were finally destroyed by the Royal Engineers diving establishment at Marchwood, who offered to remove 90 piles and two crane bases free of charge. They agreed to undertake this over a period of two years in seven to ten visits a year, using explosives. The bases of the pier supports are occasionally visible at exceptionally low tides. From the Stokes Bay pier steamers ran to Victoria Pier at Ryde on the Isle of Wight from 1863. This was originally to be under the control of the Portsmouth and Ryde Steam Packet Company at a guarantee of cost price only but the Directors of the Stokes Bay Company repudiated the agreement and briefly placed a vessel of their own on the passage. 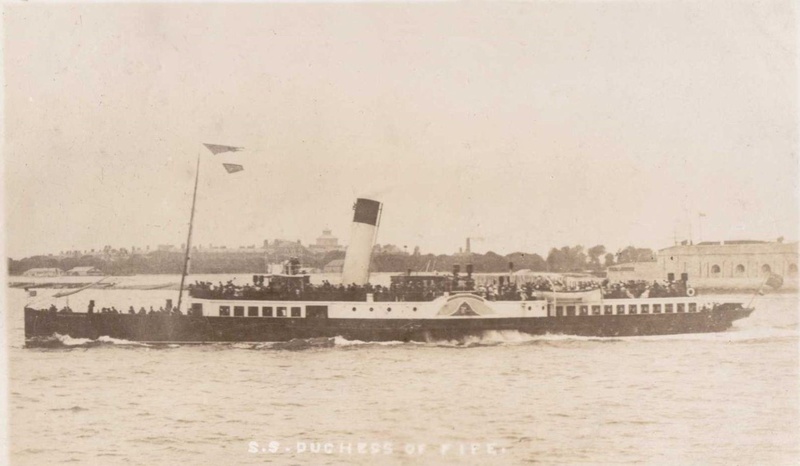 After June 1863 The Portsmouth and Ryde United Steam Packet Company vessels "Her Majesty" and the "Prince of Wales" provided the service from Stokes Bay Pier. "Her Majesty" was running on the route in 1866, after the Packet Co had been taken over by Ryde Ferry Company and presumably this continued for some years. More details here: Gosport.info website. 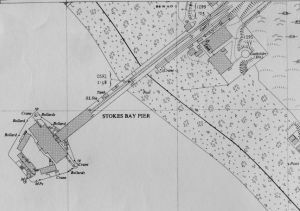 The Stokes Bay railway was bought by the LSWR in 1875, but it could not have been before 1876, when Portsmouth Harbour Station was opened, that the joint LSWR/LBSCR boats came into use on the Portsmouth-Ryde service and, presumably, from Stokes Bay. The Battery at Gilkicker Point commands the greater part of the roadstead of Spithead and its approaches, also the entrance to Southampton Water. Gilkicker must be well known to all visitors to the Isle of Wight, for it is a conspicuous object viewed from the steamers which cross either from Portsmouth of from Stokes Bay to Ryde pier. 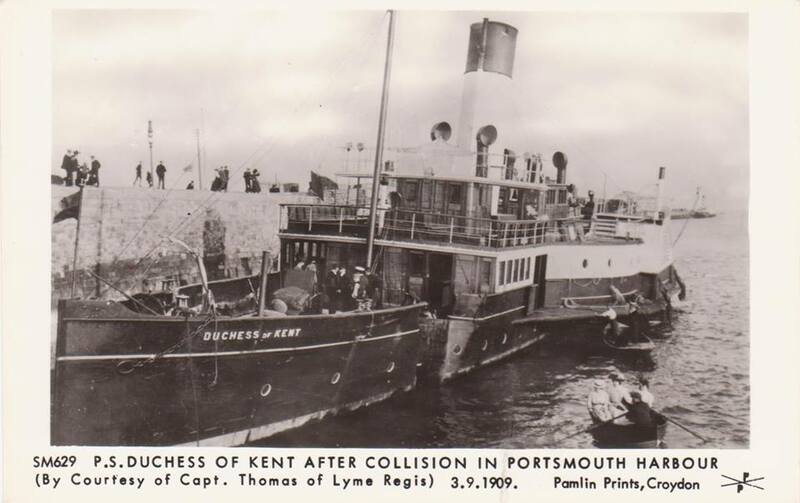 In April 1884 the PS Duchess of Edinburgh was launched, owned jointly by the London and South Western and the London and Brighton South Coast Railway for use on the passenger service from Ryde to Portsmouth and Stokes Bay. Her sister ship the Duchess of Connaught joined her a fortnight afterwards. By 1901 the Duchess of Fife, Alexandra, Duchess of Kent, Princess Margaret and Duchess of Albany were also ploughing their way across the Solent for the Joint Railway, Southampton and Cowes Companies Steam Packet Service to the Isle of Wight on routes from Ryde to Portsmouth and Ryde to Stokes Bay. The engines that ran to Stokes Bay Pier were the Gosport engines: Beattie Locomotives, (154 'Nile,' 155 'Cressy' and 156 'Hague'). They were followed by a Beattie Well Tank Locomotive, possibly 250 until 1895. Trains ran from Fareham to Gosport and then on to the branch line to Stokes Bay Pier. Eventually a new section of line (chord) completing the triangle at Lees Lane allowed trains to run from Fareham to Stokes Bay from June 1865. Another postcard view along Stokes Bay with the pier in the background circa 1958. A view across the Stokes Bay moat towards the pier. Did Queen Victoria ever use Stokes Bay Pier? 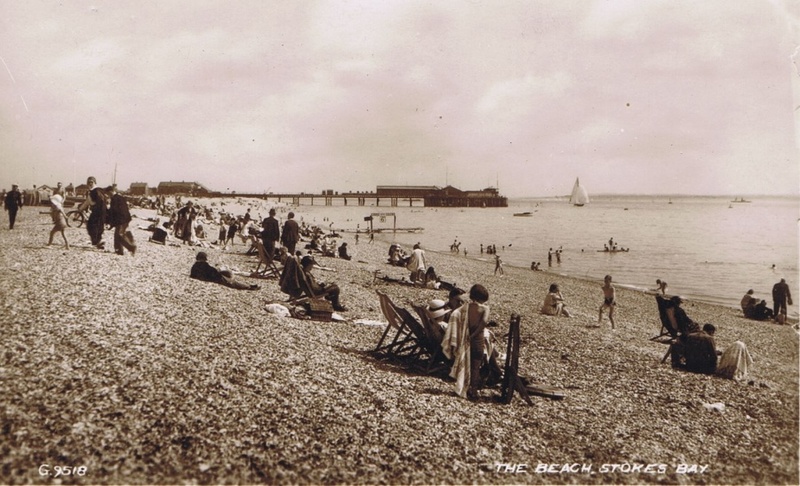 One local Author Peter Keat states that she probably did not and that the tales of her landing on the pier were unfounded. "Local hearsay says yes but the Queen's well-known desire for privacy leads one to disbelieve the local tales." However an article in the Hampshire Telegraph on Wednesday 7th February 1880 indicates otherwise. The Queen accompanied by Princess Beatrice, left Osborne on Wednesday for London. Her Majesty was attended by General Ponsonby and Lord Bridport (in waiting) Lady Southampton and the Hon. Miss Stopford (ladies to waiting) Colonel Loyd-Lindsay, Sir John Cowell, Captain Edwards R.E. Mr Sihl and Dr Marshall. Owing to the dense fog which prevailed the ordinary route from Cowes to Clarence Yard had to be abandoned and the Stokes Bay route substituted. The Queen and suite embarked shortly eleven o'clock on board Alberta Staff-Captain Alfred Balliston, Captain Thomson of the Royal yacht Victoria and Albert being also on board. The Alberta proceeded at a very slow rate of speed piloted by the Elfin, and the steam whistle was kept continually blowing, while a steam whistle on Stokes Bay Pier was blown at frequent intervals to indicate its position. Stokes Bay was reached at 12.25 and Her Majesty was received by Admiral Alfred P. Ryder, Naval Commander-in-Chief, who was attended by his Flag Captain (Captain Culme Seymour), Lieutenant-General H.S.H. Prince Edward of Saxe-Weimar and staff. The Royal special train left for Victoria at 12.33 and was two hours late. The railway arrangements were carried out under the direction of the London and South-Western Company; Mr E.W. Verrinder, Traffic Superintendent, and Mr Joseph Dyson District Superintendent at Gosport. Her Majesty appeared in good health and expressed herself much pleased with the arrangements for her journey. An entry in Victoria's Journal for 4th February 1880 confirms her landing:...it was decided we should go but very slowly crossing to Stokes Bay. No vessels were out and there could be no danger so at 11 we left the house with Beatrice and all the ladies and gentlemen embarking as usual at Trinity Pier our crossing was very disagreeable as we literally crawled across blowing the fog horn constantly, the Elfin answering by bells and unable to see anything but a few yards all around though occasionally it was a little better. We had some difficulty in finding the pier and a man called out "I am Stokes Bay Pier". It was 1/2 past 12 when we we at length landed. We stepped on to the pier and at once entered the train. There was no station only a covered shed. On Feb 6th 1880 the Court Circular recorded that Her Majesty left Buckingham Palace at a quarter past ten for Osborne using a special train on the South West railway via Clapham Junction to Stokes Bay. On December 25th 1882 the Times reported The Queen accompanied by their Royal Hignesses the Duke and Duchess of Edinburgh and Princess Beatrice and attended by the Dowager Marchioness of Ely, General Sir Henry Ponsonby, Major General Sir John O.Neill and Lieutenant Colonel The Hon W. Carington left Trinity Pier East Cowes at 11'oclock today and proceeded on board the Royal Yacht Alberta, Captain Thomson, to Stokes bay where the Royal party landed and drove to the Royal Naval Hospital at Haslar. Again on January 20th 1882 she travelled to the Stokes Bay Pier and there boarded her train for Bagshot. H.R.H. 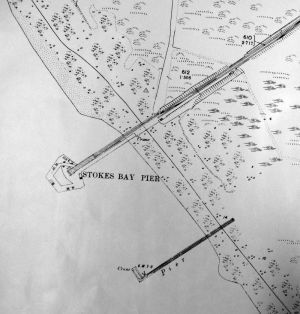 the Duke of Connaught took advantage of the pier when he landed there in May 1891 in order to inspect the men of the First Volunteer Brigade Southern Division Royal Artillery who were encamped nearby at Fort Gilkicker. I am indebted to 'Tom' of the Paddle Steamer Picture Gallery and Philip Eley, Gosport Historian, for help with this page. For reference, the circle of concrete to the left of centre is the stand for the gas tank shown on the 1950 plan above.